Μου αρέσει γιατί έχει εκπληκτικό εξώφυλλο! Η ιστοσελίδα του βιβλίου εδώ. Μια γεύση από το βιβλίο εδώ. 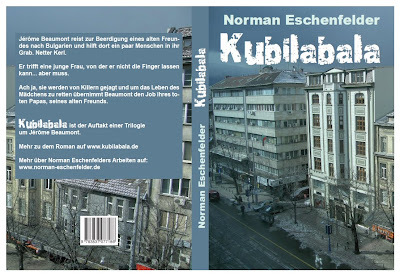 [ENG] I am not going to tell you what the title means, because, simply, I do not know... "Kubilabala" is the new book of the 23 years old German writer, Norman Eschenfelder, and its story takes place in Bulgaria... According to the author, it the first book of a trilogy with the adventures of Jérôme Beaumont... I love this book because it has an amazing cover! A site dedicated to the book can be found here. Preview at Google Books, here.